When Dr. Andreas Eenfeldt (www.dietdoctor.com) asked his followers what one food they missed the most while following his low-carb/high-fat regimen, bread topped the list by a wide margin! Beer, often called “liquid bread,” came in third, pizza and pasta, which are just bread by other names, took fourth and fifth place and chips were number six. Sweets were the second hardest foods to give up, but we clearly miss our starchy breads, snacks, and nibbles much more than anything else! I didn’t really think much about what I was eating when I first started a low-carb diet 16 years ago. I was so thrilled to have found the key to staying thin and healthy that even a food-lover like me could resign herself to a diet of boiled eggs, sugar-free Jell-O, and pork rinds as long as I was losing a pound a day without hunger. When my dramatic results convinced my husband to join me, I realized this was not going to be a “diet” that lasted for a few weeks, but a whole new lifestyle. If we were going to stick to it for the long haul, we needed good, nourishing food that wouldn’t leave us feeling deprived. When I talk to people about this way of eating, I tell them that it is not about vanity or even weight loss; it is about how long you will live and how healthy you will be. Often they already know they need to cut the carbs, but they don’t think they can do it so they won’t even try. The best argument I can make is this: You don’t have to give up sweets and breads to give up sugar and starch. Why make it harder than it needs to be? You just need new recipes. This is one of the most useful of all my recipes, especially for someone who is new to low-carb and still suffering from junk food withdrawal. (It gets easier. Honest.) Once your body adjusts to burning fat for fuel instead of burning sugar and storing fat, the cravings will diminish. These versatile little crackers, chips, or cookies taste great, are easy to make and they provide a handy platform to load up with butter, cheese, guacamole, and all the other good things that are allowed on this diet but no other. They are sturdy enough to use with dips and spreads and the variations are limited only by your imagination. 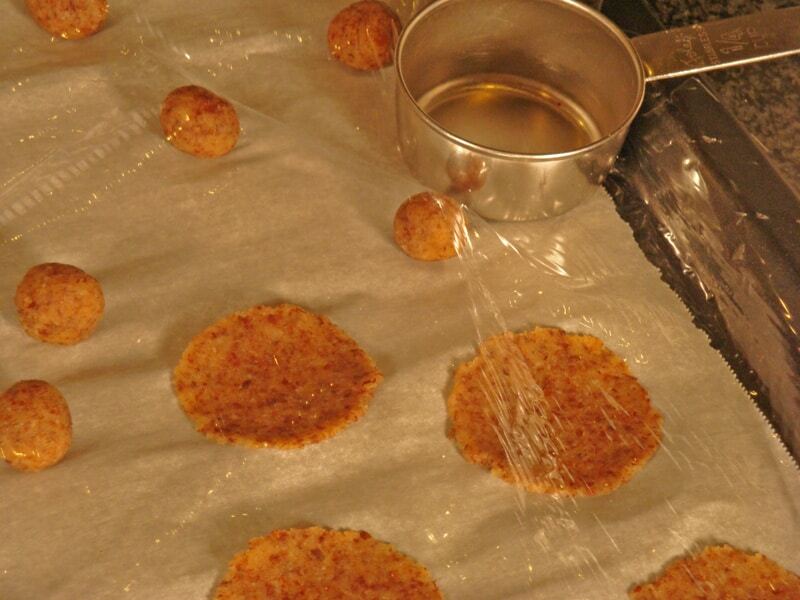 Preheat oven to 325º F. Place a piece of parchment paper on a baking sheet. You will also need something for pressing the crisps, like a flat meat pounder or a measuring cup with a smooth, flat bottom, and some plastic wrap. Whisk egg white until blended. Add remaining ingredients and mix well. Form dough into 48 small balls. They should be about ½-inch across. Place balls 3 inches apart (to make room for the tool used to press the crisps) on parchment-lined pans. Cover with a sheet of plastic wrap and flatten balls into thin circles, roughly 2 inches across, with a flat implement. Carefully remove the covering. Place in preheated oven and bake for about 10 to 12 minutes or until golden brown and crisp. Repeat with remaining balls. Store in an airtight container. 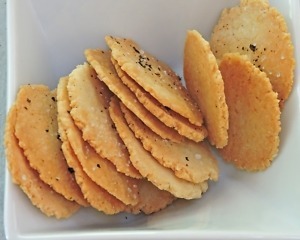 Gourmet crackers to serve with soups, dips, and spreads that taste like Pringles potato chips! Make basic Almond Crisps, above. Add 3 tablespoons (⅜ ounce) of finely-grated Parmesan cheese and a dash of freshly-ground black pepper to mixture. Sprinkle crisps with coarse salt and more fresh pepper before baking. A small, crunchy cookie or two can make a scoop of sugar-free ice cream or a rich chocolate mousse extra special while adding almost no carbs. Make according to directions for Almond Crisps, above. Sprinkle with cinnamon and granular xylitol before baking, if desired. This article appeared first in the August 1, 2016 issue of the Low Carb Direct Magazine. Almonds, Bread substitutes, No deprivation, Nuts. Bookmark. I am allergic to egg whites. Do you have a suggestion for a substitute? I have also become allergic to chicken eggs! Your might try duck, goose, or turkey eggs if you can find them. I can eat quail eggs without reacting at all, but they are too hard to separate when you need just the whites. There is an egg sub made of tapioca that works well as a replacement for whole eggs, but I’m not sure how it would work for just whites; it is from Namaste. It also adds a few more carbs to the recipe. When you say “1 cup” followed by “(4 ounces)”, I get very confused! Ordinarily I would measure in a cup to 8 oz? Hi MH Lined. You are confusing weight with volume. A cup of flour fills an 8-ounce measuring cup but it weighs 4 ounces. If you use a scale to measure flour, you would add 4 ounces.